This satirical novella, published in more than 200 editions, was the biggest seller in the United States prior to "Uncle Tom's Cabin". A young English girl is lured to America by a dashing lieutenant who cruelly abandons her. Three 90-minute cassettes. 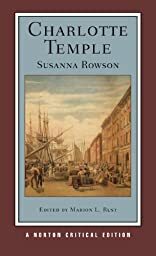 About Susanna Rowson (Author) : Susanna Rowson is a published author. Some of the published credits of Susanna Rowson include Charlotte Temple (Norton Critical Editions).